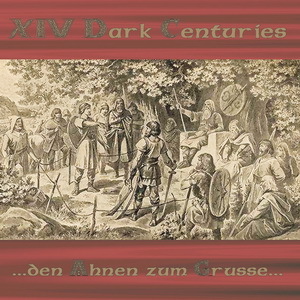 Without loosing the straight parts of "... den Ahnen zum Grusse...", XIV Dark Centuries created a mixture of pure Metal and Folk influences. Clean Voices, accoustic guitars, flutes and mouthharp make the music more traditional. This mixture of fast and straight Metal with folk influences, is the result of the further developement of XIV Dark Centuries´ own style. It´s called "Heathen Thuringian Metal". MCD "Jul" is the result of hard work of composition after the "...Ahnen..." release. Many good songs were written. "Jul" is a look forward to this work, that will come on top with the next Album. That means Metal with many kinds of influences like Black Metal, Heavy Metal, Pagan Metal and with more folk influences. Accoustic guitars, flutes and germanic warrior choires are getting in contact with the full hardness of metalguitars, Black Metal Crowls, orchestral Keyboards and strong Basslines. The ground of the music is based on a powerful drumming. The band plays fast and midtempo songs and also traditional music in the way of old bards. 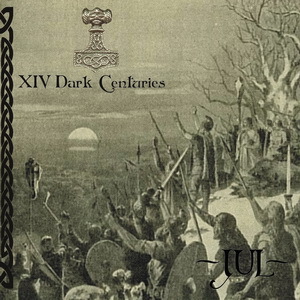 In the lyrics on "Jul" XIV Dark Centuries tells the stories and myths about the time of Yule. On this MCD the band is practising for the first time a song in language of the old germanics. This one is a Folksong and is called "Liodhahattr" and tells a story of the "Elder Edda".